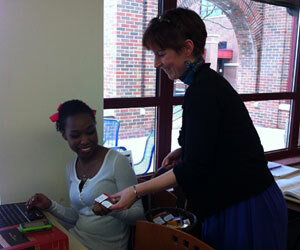 Elizabeth Nicholson (right), Information Services Librarian, hands a treat to sophomore political science major Fatimah Green as part of Phillips Library's candy campaign. While just getting back from spring break, now is the time Aurora University students should be doing research for final papers and projects — and they are getting a tasty reminder of that from the AU librarians. A year ago, the Phillips Library staff became concerned that some students were waiting too long to start research and thereby limiting access to all the resources available to them. That’s because while Phillips Library has about 100,000 books in its collection and offers access to 30,000 periodical titles through its subscription databases, it also belongs to a consortium called I-Share that gives AU students free access to the resources of 76 other academic and research libraries in the state of Illinois, including large research institutions like the University of Illinois. If students wait until the night before a paper is due (never a good idea anyway! ), it’s too late to borrow these additional resources. 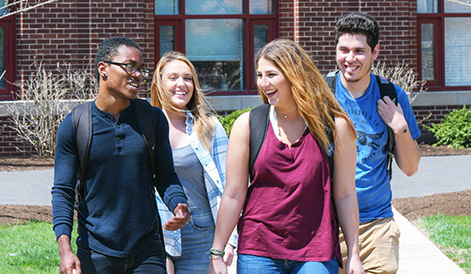 It usually takes only a week or so to put these resources in the hands of AU students, but even that is too long for a student who waits until a day or two before a paper is due. Last spring, librarians bought 500 fun-sized Nestle Crunch bars and attached a note to each that said “Don’t wait till Crunch time!” with a reminder to get started on research and contact information for reference help. They fanned out across campus and distributed the candy wherever they found students congregating: the Dining Hall, Thornton Gymnasium, Vago Field, the Dunham atrium, even the parking lots. Students loved the candy and appreciated the reminder to get going on research. They also appreciated the many ways they can contact librarians for assistance. In addition to in-person help during the 81 hours a week that reference is offered, students can also call, email, text or live chat via instant message with the librarians for help. In the fall, the librarians repeated the exercise, but this time with Airhead taffy and a note that said “Don’t be an Airhead! Do your research now!” Today, AU students returned from spring break, so the AU librarians were out in full force once again, this time with notes that read “Don’t let your papers be duds!” attached to — you guessed it — Milk Duds. The program was the brainchild of Elizabeth Nicholson, part-time Information Services Librarian. Nicholson says she has enough slogans for about 10 more candy campaigns. If you’ve got a good idea for a tag line, send it to her. Meanwhile, if you see a librarian walking around campus, chances are she wants to give you a treat and a gentle reminder to not procrastinate! Amy Schlumpf Manion has been an Information Services Librarian at Phillips Library of Aurora University for 10 years.